I can’t believe this crust, I can’t believe this pie, and I can’t believe I made it….It’s SO FRICKEN DELICIOUS. Served topped with Coconut Bliss Vanilla Ice Cream.…to die for…. Add ice water 1T at a time using a wooden spoon to mix it in, grabbing the flour as you go. Only add as much water as you need to help it come together to form a ball. With the soft dough, gently work it to form a ½ inch thick disc. Lay the disc into your pie dish or tartlet pans and gently use your hands to form it into the pan, working the crust up along the sides. Gently coax it from the center out working to get it the dough evenly spaced and as uniformly thick as possible all around on the bottom and sides- feel for thickness as you spin the pan. Work the dough up the sides of the pie dish. You can leave a straight no fuss edge or I like to make a curve design by pressing my knuckle in between the pie dough and my finger knuckle. Place the crust into the fridge for 15-20 minutes to allow it to firm up. Mix all of the ingredients together; the apple slices, lemon juice, essential oil, maple syrup, coconut oil, cinnamon and salt and set aside. *Do not put filling into the fridge just before spooning into the crust, as the oil will set up. In small bowl mix together the flour, sugar, salt and cinnamon. Add the chilled coconut oil and cut in using a fork or two knives, mix until you have a course, crumb. Preheat the oven to 400 degrees. Make sure the oven is hot prior to adding the pie!!! Take the prepared crust out from the refrigerator. Using a slotted spoon, layer in the apples, heaping them in the center. Sprinkle all of the Crumble Topping over the whole pie. Using a solid spoon, ladle in all of the juices from the apples over the top. Bake for 35-40 minutes or until the topping is golden browned and apple filling is bubbling. Wait at least 30-40 minutes prior to serving. AMAZING with Coconut or vegan Vanilla ice cream. 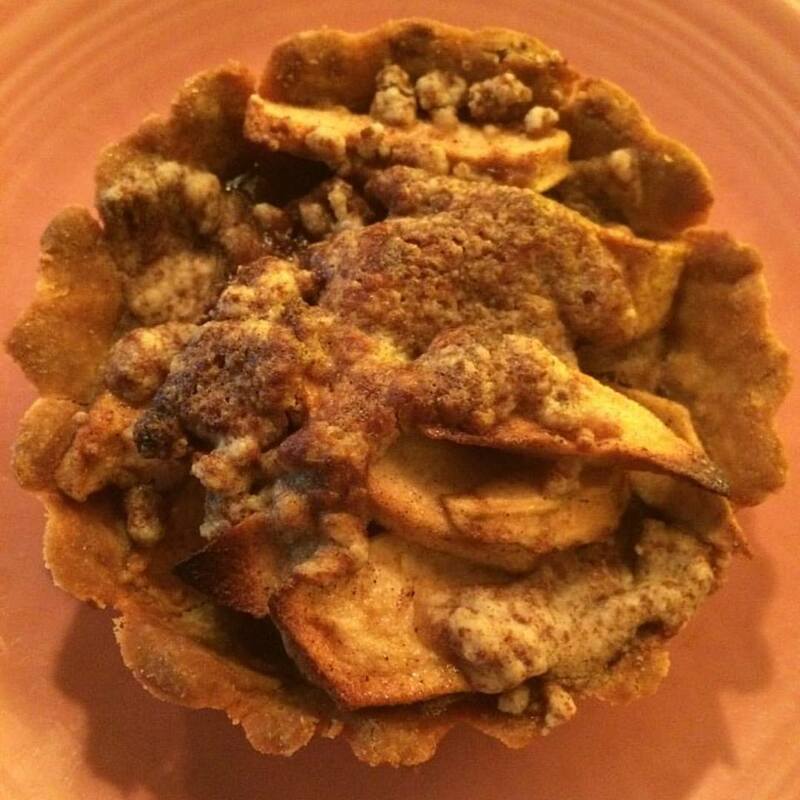 This entry was posted in desserts, Gluten Free, pies and tagged apple pie, apples, fall veggies, fruit pie, gluten free pie, pie, vegan desserts, vegan pie. Bookmark the permalink.